Partiers, especially young urban drinkers, are very susceptible to abuse alcohol consumption. A lever for alcohol consumption is believed to be boredom. HEINEKEN aims at preventing abuse of alcohol consumption by changing the behaviour of club partiers: better entertained, they drink less and slower throughout the night. Beer is a natural product enjoyed by hundreds of millions of people around the world. For most adults it is, and can be, part of a healthy balanced lifestyle when consumed in moderation. The vast majority of people enjoy beer responsibly. However, there are still too many people who don’t. There are clear health and behavioural risks associated with consuming too much alcohol, either over time or on single occasions. For some occasions and some people, it is better not to drink at all. HEINEKEN has a long history of encouraging responsible consumption. HEINEKEN’s goal is to make moderate, responsible consumption aspirational. It believes that when brands communicate directly, the message resonates more strongly with consumers. PRINCIPLE: As part of their commitment to advocate responsible consumption, HEINEKEN has pledged to use the Heineken® brand to help make moderation aspirational. In 2014, HEINEKEN built on its previous efforts with the launch of the campaign ‘Dance More, Drink Slow’, based on a nudge experiment showing that partiers drink less when their attention is retained with immediate fun and a better ambiance. 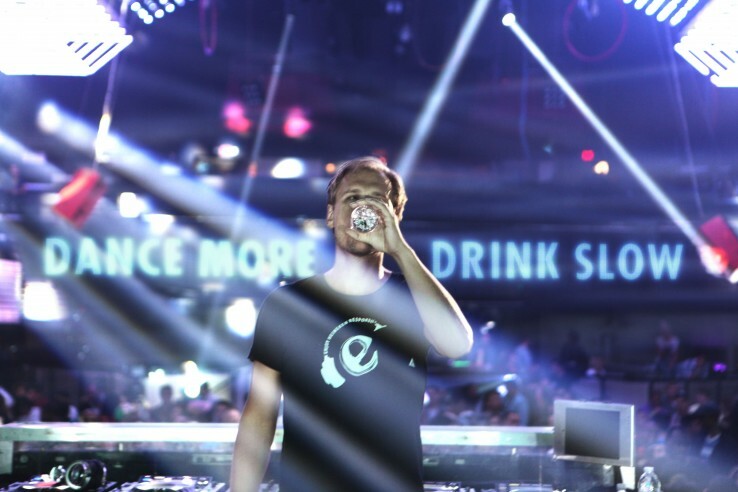 ‘Dance More Drink Slow’ was the world’s first responsible drinking campaign to target consumers on and around the dance floor. The moderation message to consumers is simple and relevant: stay in control and you can enjoy your night more. EXECUTION: HEINEKEN organized a videotaped party in a night club with acclaimed Dutch DJ Armin van Buuren. With better music being played, the crowd was kept entertained and drank less. ‘The Experiment’ – HEINEKEN organized two videotaped parties in the same club. One night displayed passable music, while the other one was anonymously livened by Armin van Buuren. During the second party the music was better enjoyed by the audience, thereby resulting in more people hitting the dance-floor and in drink sales dropping (632 drinks vs 1078). The campaign ‘Dance More, Drink Slow’ – Activated by 44 markets, it has reached a large global audience. ‘The Experiment’ has been viewed 26 million times on YouTube and other online portals, making it one of the most watched Heineken® videos ever. At four nightlife events in Vietnam, Brazil, Mexico and Chile, more than 600,000 people experienced Armin van Buuren playing the campaign track and highlighting its meaning. It was also shared at the Holland Heineken House, a meeting place for athletes and supporters, at the Winter Olympics in Sochi, Russia. Total media coverage of the campaign has reached 212 million people. As a result, an increased number of Heineken® fans agree that they ‘appreciate people that have a good time during a night out, but stay perfectly in control’ and that Heineken® is a brand that is truthful, and acts responsibly.